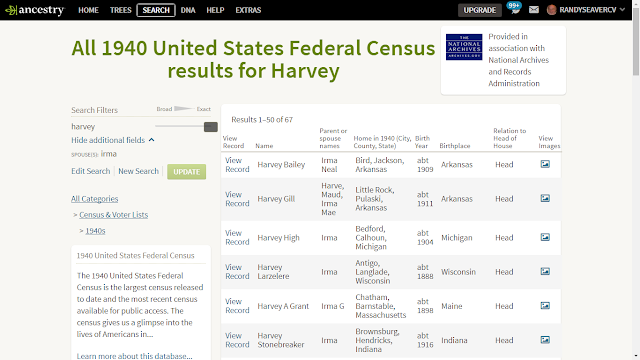 Genea-Musings: Harvey and Irma - Aren't Search Engines Great? While trying to go to sleep last night, I wondered to myself "How many records are there with a man named Harvey and a woman named Irma (the names given to the two recent large hurricanes that hit the U.S. mainland recently)?" They are both relatively uncommon first names, especially in the last 50 years or so. And many more! Ancestry told me there were 2,343 results for my search criteria - and they did it in a search that took less than two seconds! Aren't search engines great? I think my favorite "name" is Harvey Romeo who married Irma Jackson in 1938 in Polk County, Florida.